Great office, great staff, and Dr. Ramani was wonderful. I felt very at ease the entire time, and couldn't have askedfor a better diagnosis and surgical procedure for my injured toe. Highly recommend! Great office, great staff, and Dr. Ramani was wonderful. I felt very at ease the entire time, and couldn't have asked for a better diagnosis and surgical procedure for my injuredtoe. Highly recommend! Very attentive and professional. Listening and creating a good plan of care with me. Very kind and polite doctor. Dr. Mona N. Ramani completed her undergraduate studies in Economics at the University of Maryland College Park where she graduated with honors. She went on to receive her doctorate from Temple University School of Podiatric Medicine in Philadelphia in 2015 where she received the Academic Merit Scholarship. 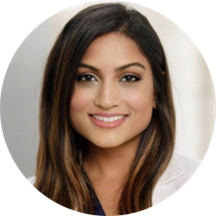 Dr. Ramani served as Chief Resident at Englewood Hospital and Medical Center in New Jersey, where she received extensive training in reconstructive surgery of the foot and ankle, lower extremity trauma, and diabetic limb salvage. As an avid skier and former gymnast, Dr. Ramani’s passion lies in the rehabilitation of sports injuries to the foot and ankle. She combines her biomechanical and surgical knowledge to provide treatments that get her patients back to their busy lives as quickly as possible. Dr. Ramani believes strongly in fostering the doctor-patient relationship by partnering with her patients to reach their treatment goals. Her commitment to her patients is to provide exceptional and compassionate care as she imparts the most innovative and up to date treatments available. Dr. Ramani is a European trained nail reconstructionist, a certified arthroscopic surgeon, has trained in minimally invasive surgery for the foot and ankle including being a certified Tenex Treatment specialist. She is an active member of the American Podiatric Medical Association, American College of Foot and Ankle Surgeons, and The Academy of Ambulatory Foot and Ankle Surgery. Raised in a traditional Hindu family, Dr. Ramani is a disciplined and well-rounded physician. Her hobbies include tennis, yoga, and traveling. It was a great experience seeing Dr Ramani! Her staff was welcoming, great location, great atmosphere. She helped solve my problem. The wait time was just longer than expected! Saw Dr. Ramani for a second opinion. She was good, very helpful and she has some really good insights and recommendations for my issue. My only issue was that I was 15 min early and they didn't even call me inuntil over 30 min late, and it was an hour after my appointment before I actually got to see the Dr. Not sure if I caught them on a bad day but I don't have time to have appointments start an hour late as it messes up my entire schedule for the day. She was very informative and helpful! She made sure that my insurance paid for certain procedures first before I continued and also provided me with everything I needed for my injury. Very encouraging and made my day a good day instead of bad. Not a great experience. Waiting for almost one hour before being seen. The doctor was nice and listened to what I had to say but didn't check my posture, gait or even referenced the x-rays just taken. And once she realizedthe insurance wouldn't cover the cost of orthopedics, didn't really provide any tangible solution. She is nice and great! Dr. Ramani is great! She knows what she is doing. From this day forward Dr. Mona Ramani will be my only doctor for foot pain. She explained everything to me clearly and understood my issue right away (Heel Spurs). She prescribed me two medications and a stretching exercise that worked almostimmediately. Since seeing her and following her instruction my heel pain has reduced dramatically. I can't thank her enough. She is SO sweet and made me feel so comfortable! She answered all my questions and reassured me that I would be fine. Would highly recommend Dr. Ramani! She is great! I would highly recommend her. So gentle and super nice! On time. Great office staff. Very patient and thorough. I learned a lot and got answers to my questions. The doctor was friendly and knowledgeable. We decided on a course of treatment to address my pain and longer term flexibility issues.The office staff was friendly, helpful, and efficient. Great first time visit. Great staff, very nice Dr. She explained everything very well and I felt comfortable with her diagnosis and suggestions. Overall a very good experience as a patient. Dr. Ramani and the office staff were extremely courteous and friendly, which makes it that much more worth it. Dr. Ramani was clear and descriptive about my issue and responded with care to my questions. I look forward to being apatient of this facility due to the care I've received thus far! I was fortunate to schedule a same-day appointment. Dr Ramani has a beautiful, clean office in the Historic Woolworth Building. Friendly and courteous staff and overall a very positive experience. My ingrown toenail is now just a bad memory! First-time visit probably made the wait longer than normal, which is to be expected. Dr Ramani was very professional and friendly while greeting me. She asked me why I was there and listened intently as I expressed my concerns. Dr Ramaniwent over some possible reasons for my discomfort and addressed all of my questions. She treated my issues promptly. I will be returning for future care. Dr. Ramani’s staff is extremely friendly and knowledgeable enough to know I needed x-rays (in their office) before seeing the doctor, based on my description of my condition. This was efficient and seamless. Then, Dr. Ramani saw me and quicklyassessed the issue but took the time to walk me through the details and different treatment options. I asked many questions and raised some concerns and she took them all very seriously and answered in detail. I was very impressed and would highly recommend her. Really nice and solved my issue quickly. The office is just a few of blocks away from the WTC PATH station. I didn't have to wait at all for my appointment. Dr. Ramani is a wonderful doctor. I learned a lot in just a short visit, and she is very kind and pleasant to speak to. Aside from the wait time, I had a wonderful appointment with Dr Ramani and would highly recommend her. She has a great bedside manner, even when delivering bad news (that I require surgery). She explained everything very thoroughly, answeredall of my questions, and made me feel very confident with her assessment and treatment. Very professional and caring about my issue. Direct and to the point with information and next steps. Wait time could have been a little better. I loved Dr. Ramani! She answered all of my questions, laughed at my weird jokes, explained things in detail, and was in general very kind. She is very friendly, gentle and smart. What I appreciate most was that I was on my lunch break and she was willing to work with the time I had. Dr. Ramani was great. Everyone at the office made me feel comfortable. Dr. Ramani was very knowledgeable and gave me a detailed plan to treat my ailment. Way better than any other podiatrist I have seen. Very pleasant demeanor and extremely thorough.